After an incident that occurred yesterday morning, the Bryant Park Shoeshine Stand on 42nd Street and 5th Avenue is temporarily out of service. Over the years, the wonderful managers of the Bryant Park stand have gained an impressive following of midtown businessmen and women seeking a sleek and shiny finish to their shoes. 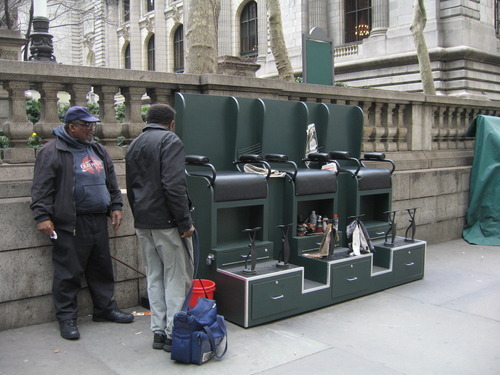 Beginning tomorrow, our operators will temporarily relocate their business to the shoeshine stand at Greeley Square Park. The stand is located on the 6th Avenue side of the park, close to the 32nd Street PATH Train entrance.